Barbecue Sauce... Blueberry style! - Canning Homemade! Home » BBQ » Blueberries » Cherry » sauce » Barbecue Sauce... Blueberry style! Lisa gave me an amazingly inspiring recipe that at the time she posted it for me to check over I just happen to have all the ingredients available. 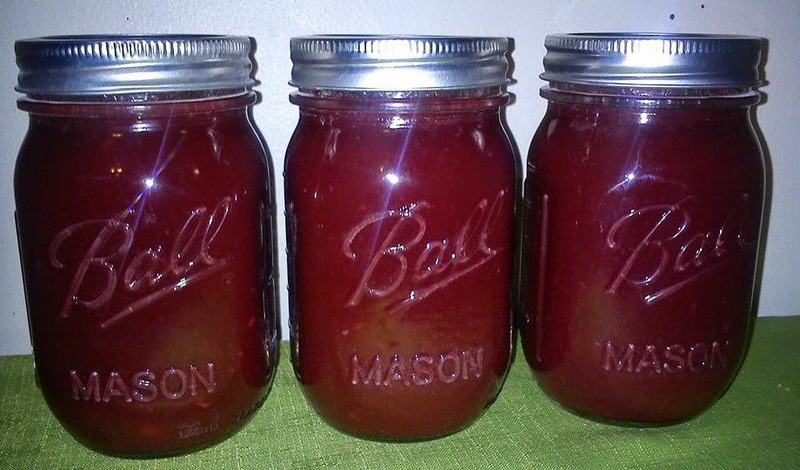 The other night I put them together and came up with a safe and great fruit barbecue sauce. I have a post on my recipes using a bbq sauce for Rhubarb (Victorian Barbecue Sauce) but this is tart and the cider as time goes by will leave a great sweet tang to the blueberries. I love the addition of the ginger which I used the crystallized since it was in the house. This is one of the sauces that would be great with ground beef for meatballs, on top of a meatloaf for a substitute for ketchup, or a sweet sauce for your sausage or burgers from the grill. I also think it would be amazing on chicken or pork! Combine all the ingredients in medium-sized sauce pan, stir and bring to a boil. Stir and lower the heat to a simmer. Let the sauce simmer for about 15 minutes, gently crushing the berries with the back of a wooden spoon and stirring to make sure it doesn’t stick. When the mixture has thickened or mounds on a spoon, remove from the heat. Filling the jars: On a dishtowel place your hot jars and using your funnel in each jar fill leaving 1/2” headspace. Remove air bubbles and refill to the proper headspace if necessary. Taking a clean papertowel wet it with warm water and wipe the rims of the jars removing any food particles that would interfere with a good seal. Using your magic wand extract the lids from the hot water and place them on the now cleaned rims. Add your rings to the tops of each of the jars and turn to seal just "finger tight". Processing: Make sure your rack is on the bottom of the canner and place the jars in the water bath making sure that the water covers each of the jars by 1 to 2 inches. Cover the pot and turn up the heat under the canner and wait for the water to start boiling. Once the water has come to a boil start your timer for 15 minutes. Remove the jars and place them back on the dishtowel in a place that they will sit overnight to cool. Do not touch or move them till the next morning. A variation on this barbecue sauce can be made with Cherries. Erika did a great job just by substituting pitted cherries in the same amount for the blueberries. Here is the result! Thank you Erika for letting me share your work!